I asked him about this, and he confirmed that, yes, he would like a teddy bear. His class made teddy bears earlier this year and learned about the history of the teddy bear, etc. I guess that's where it came from. But of course, now I'm thinking.....Hey, I could KNIT HIM A TEDDY BEAR!! I poked around the Tangled Web, found a Fiber Trends pattern and some lovely Berroco Peruvia yarn (we just started carrying this yarn this year - it's gorgeous, nice to work with and it costs like a penny for 174 yards.) 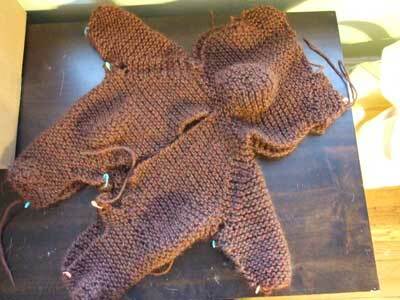 Anyway, here is the bear ready to be sewn up. I'll see if I can felt him tonight. I made a felted Fiber Trends koala bear a couple of years ago that came out smashingly koala-like, so I have a good feeling about this fellow. He was supposed to be knit with his clothes as part of his body, if you know what I mean, but I thought that would look weird and besides I thought I could make him a little sweater too. And a hat! And some mittens! And some socks! Help! Stop me! That's gonna be adorable. I would set yourself a wardrobe limit for the bear - maybe five pieces. You could do a Phillies shirt! And cap! Or a cute little tiny cardigan! Teddy bears I can understand. All those other things leave me, a poor old twentieth centurian, grasping at air. Are they gonna teach him about Theodore Roosevelt? suzanne - oh yeah, you know what I'm talkin' about! 5 item limit sounds good, but do socks count as 2 items? cg - oooh, a Phillies theme! ggd - the bear he made at school he named Teddy Roosevelt, so I think he knows. That boy is so smart!